The Davidson County Education Foundation (DCEF) is a non-profit, volunteer organization dedicated to the enrichment of educational opportunities in Davidson County. Our mission is to provide and support innovative programs that benefit the students of the Davidson County Public School System. DCEF was established in 1992 by local school supporters led by businessman Bernard H. Thomas who served as its first president. DCEF is an organization whose Board of Directors is comprised of local school supporters who volunteer their efforts on behalf of the students and staff of the Davidson County Schools. Innovative programs include the Bernard H. Thomas Student Leadership Academy, STARS - Students Teaching and Reaching for Success Academy, Teacher Mini-Grant Program, Endowed Scholarships and Project Potential Scholarships. DCEF hosts an annual 5K Walk/Run to raise funds to support Davidson County Schools. highest percentage of participants in the DCS district enter in the DCEF Fun Run! 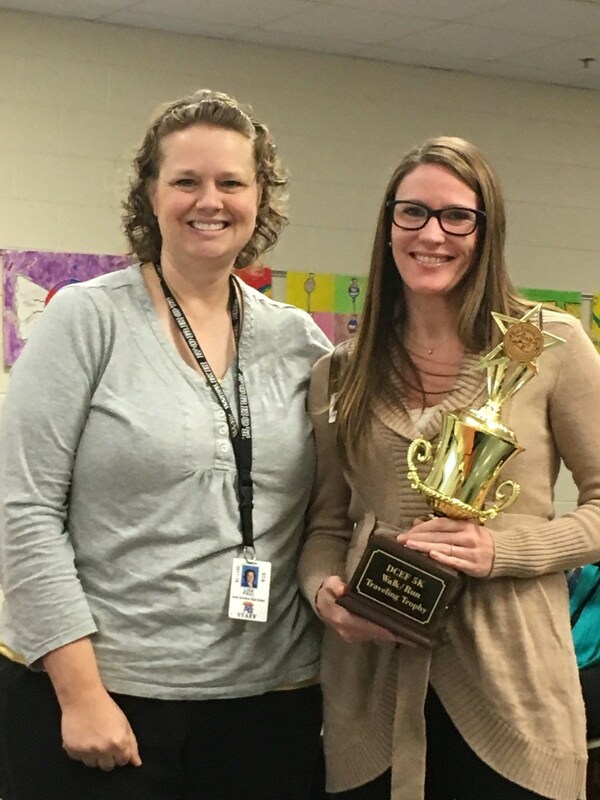 Melissa Glover, principal receives this award from Lisa Paul, DCEF member.